The NGC 3158 group is composed of 8 NGC galaxies and many others a bit over 300 million light-years distant by redshift. NGC 3158 is a huge Elliptical galaxy whose gravity anchors the group. I get a size of 275,000 light-years for its outer reaches. It was discovered by William Herschel on March 17, 1787 and is in the second Herschel 400 object list. Half the NGC members were found by Guillaume Bigourdan on February 1, 1886. He found NGC 3150, 52, 59 and 61, all in the southern part of the group. R.J. Mitchel working for the Earl of Rosse found two, NGC 3152 and 3160 with the last, NGC 3163 also found by William Herschel the same night as 3158. It however isn't in either Herschel 400 listing. NGC 3159 is listed as an E2 spiral and as peculiar. That may be due to the very faint plume to the south. Ignoring the plume it is 67,000 light years across. The plume fades away so I'm hard pressed to determine an edge but my best guesstimate puts it at least 200 arc seconds long making it over 300,000 light-years in size though of much lower mass than NGC 3158. NGC 3160 is a strange spiral likely involved in a collision to create its odd structure. It is about 83,000 light-years across. NGC 3151 at 60,000 light-years is a SA0 Galaxy/ NGC 3152 is also rather odd being a ringed barred spiral with no arms, just the ring. NGC 3160 is a warped spiral seen edge on and is about 125,000 light-years wide. It appears, at least when seen edge on, as a red spiral. Even the warped plumes off its ends are mostly red indicating no new star formation of any significance for millions of years. In fact most all members of the group appear to fall in the red and dead category. NGC 3161, an E2 galaxy, is the smallest of the NGC galaxies in the group at only 57,000 light-years but does have an AGN core indicating it is still reacting to a likely interaction with another galaxy not too long in the past. NGC 3163, Herschel's other discovery is quite large at a bit over 140,000 light-years and listed as a SA0-: galaxy rather than an elliptical. NGC 3159, 3161 and 3163 appear to share a common halo indicating they may have had a close encounter with each other in the recent past. This may explain the large southern going plume coming from NGC 3159. There are many other galaxies also likely members of the group. One without redshift data is east southeast of NGC 3158, MCG +07-21-025. It isn't classified that I found and hard to observe as it is hiding behind a rather bright blue star. It makes it look like it is a red galaxy with a blue core. The annotated image identifies all I found redshifts for. Only a few not members of the group. One star-like object is labeled RQ/G east northeast of NGC 3158. RQ stands for Rejected Quasar. It apparently is just a very bright compact blue galaxy about 3.1 billion light-years distant. The Sloan image shows a slight blue disk around a bright nearly white core that is larger than a star of similar brightness. Likely it is some type of AGN, just not sufficient to be a quasar. The minor planet center shows a periodic comet moving quite rapidly in the image but I see nothing at the position. It is 3.56 AU distant from us and 3.12 AU from the sun. One estimate puts it at 22.7 magnitude which would certainly be too faint at its speed and my lousy skies to have picked up. Again this was a night of poor transparency though seeing was not good it was better than previous night. Still this image doesn't go as faint as it would under what used to be normal conditions here. The faint outer reaches of these galaxies is likely greater than I could see thanks to these less than optimum conditions. I got one more blue image than normal because I thought one blue had been hurt beyond repair and so retook a blue image another night. Turned out I meant that comment for a different image so retook the wrong one. I used all three anyway. I see alot of red points surounding the core galaxy. It looks like they are dwarf galaxies. 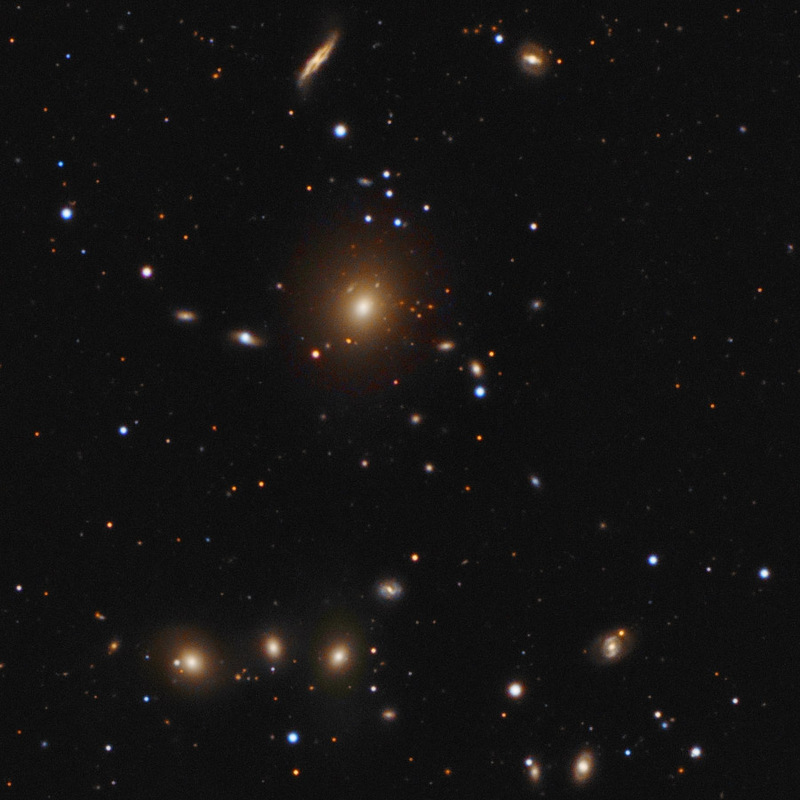 That is quite the cluster of galaxies! Great image this one, I like your work Rick! While quite effective of course, a mega data at all costs mentailty is certainly not necessary to produce fascinating images. Edited by Strongmanmike, 05 November 2014 - 10:06 PM. I found it interesting that among the blue field stars of our galaxy were some imposters. One was actually a blue compact galaxy member of the galaxy group, two were quasars at 5.4 and 9.4 billion light-years (though at those distances z is a better distance indicator) and then at 3.1 billion light-years is an object that was a quasar candidate (there are many in my images not annotated) but after investigation this one turned out to be another compact blue glaxy 10 times further away than the other but looking much the same. To me a pretty image is just that, a pretty image. It's the information you can learn from it that I find to be an images true beauty. Likely a minority opinion but that's me. I want to know what is hiding in my image, sometimes I turn up real surprises and once I missed the surprise. Another looking at the image caught what is now Li1 an unknown planetary nebula until he spotted it in my image. Now I look even closer, especially for things not in catalogs that maybe should be. Several years ago a grad student in Italy asked if I had an image of a galaxy on a certain date. Amazingly I did have it but then saw it was a month before his date. He asked for the FITS anyway. Then got all excited. Seems the star was a reoccuring nova that had blown on about the date he asked for and he was trying to pin down the exact date for his thesis. Turned out the star had a preflare on the date I took it which confounded his thesis something awful. Never did hear how that turned out. You never know what is in an image, even after you think you do that taught me. I'd wondered about the star as I assumed it a star cluster but was puzzled about it not showing in any on line image (there are many) yet it was in all my subs. But never thought much about it even when he asked for the FITS files. Another image of Arp 192 led to the discovery the rather famous jet that never was explained was an asteroid trail Arp failed to identify. Little things like these keep me digging through my images wondering what else might turn up. Also makes me wonder how much is missed in all the great images amateurs take but never investigate. I can't help wondering if these things have been found in my efforts what has been overlooked in the ton of other images out there?